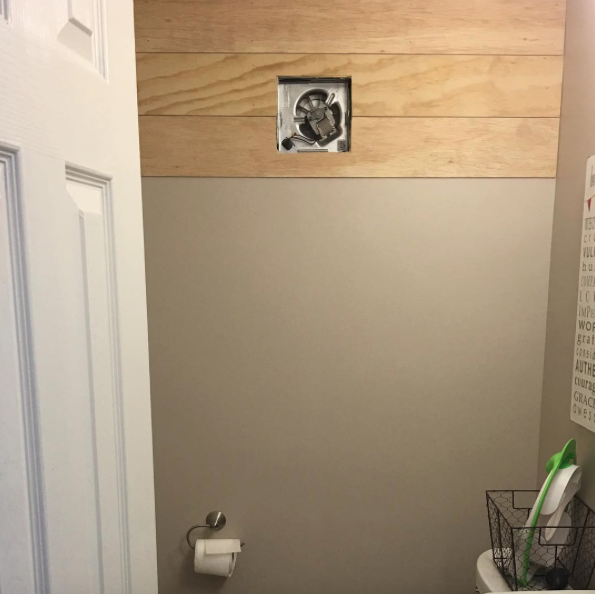 Bathroom Makeover - making over our family bathroom! Hope you’re having a great day so far! 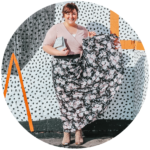 I am so excited about today’s post because it’s been something that has been in the works for awhile and now it’s finally happening! If you follow me on Instagram you’ll know that I’ve been sharing little tidbits of progress there. Well, we’re redoing one of our bathrooms! Is the main bathroom off our living area and it gets the most traffic. It’s pretty as it is now, but it just feels so cramped and small! The space was dark, cramped, and just needed an update. 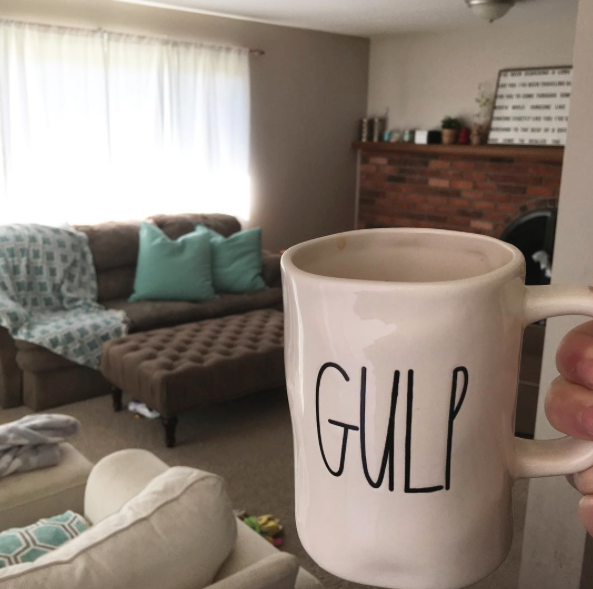 Because, you know everyone needs to take a big gulp or two of coffee before breaking ground on any project.. The boys were not as excited as my husband and I apparently. But they were great sports while we picked up the supplies needed for our project! 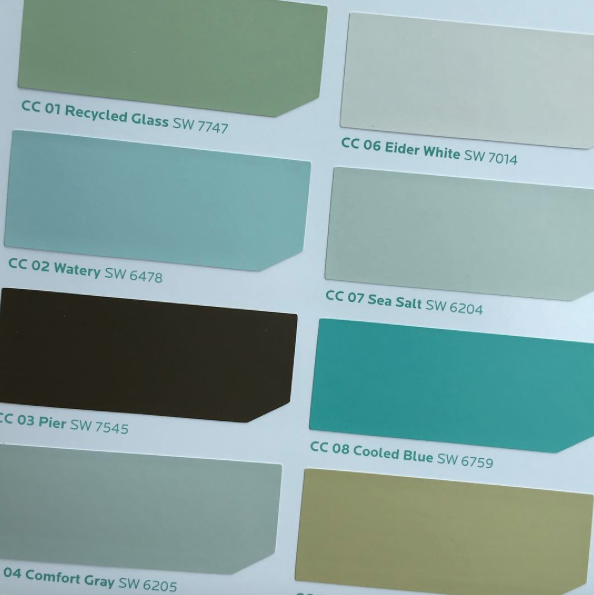 I am in love with these coastal colors from Sherwin-Williams, plus, they had a great sale this past weekend and I was able to snag some great colors that were originally out of budget for 30-40% off! Score! Can you guess which color we chose? Starting to ship lap the wall! Ever since I saw the shiplap look, I haven’t been able to get it out of my head! 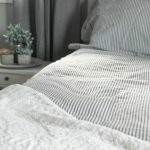 So I searched Pinterest for tutorials and started to build-out a plan of action! We used 1/4″ thick plywood, pre-sanded, cut into 6″x44″. 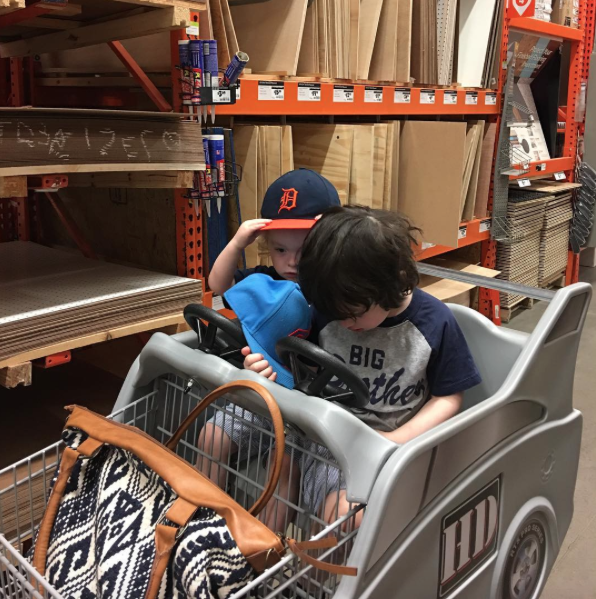 The hardware store would only cut a portion of the wood for us due to regulations, so we had to do a lot of the cuts at home in the garage, but it turned out really well! I can’t wait to show you the next steps as we get more of this project done! Be sure to follow along on Instagram for more sneak peeks! 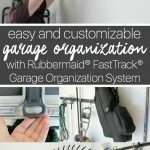 How to Easily Organize Your Garage! I can’t wait to see what you do with your bathroom! I always find makeover post to be so much fun. Side note: I think the before looks pretty darn good, myself! Thank you, Stacie! I’m excited to get to work painting everything and making it more functional for us. The pictures make it look bigger than it is – it’s SO teeny! We need to redo both the upstairs full bath and the downstairs half bath… more work needs to be done on the downstairs bathroom though. One project at a time! I love redoing rooms in my house! I can’t wait to see how great your bathroom looks when it is finished! I love watching Chip and Joanna on “Fixer Upper,” and Joanna really has a thing for shiplap. That’s where I was introduced to it and I love it as well. I can’t wait to see your final results! 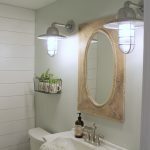 I love the shiplap in the bathroom. I can’t wait to see the rest of your updates. I need to do a few things around our house. Our flooring is terrible and we are considering doing it ourselves. I’m interested to see what you have planned. I love seeing projects like these. It’s always interesting to see what everyone comes up with. I’m sure it’s going to be amazing! Ive been watching Fixer Upper and fell in love with Ship Lap too! I had no idea it was even a thing, cant wait to see the rest. I love watching the fixer upper shows. We cut cable and I don’t get to see these shows anymore. I can’t wait to see the final makeover. What an exciting thing to do! I’m looking forward to your next makeover updates. Those colors Sherwin-Williams indeed are very pretty and I’ve been looking into shiplap walls on Pinterest too! Shiplap walls are absolutely gorgeous. ohh i will be following you on this journey bc my bathroom needs a makeover asap and I really want to see how yours turns out! good luck!!! I am excited to see how your makeover turns out. The boards you’ve set up on the wall gave a “cozy” feel and I can’t wait to see other stuff you’d put in there. Please keep us posted! I can’t wait to see the “after” of your bathroom! I’ve been planning to do some changes on ours too. I’m sure it will brighten that space up. The ship lap is hot right now so I can see how you like it. I might try that in one of my own bathrooms! That must be so much fun. Changing things and making things look different. I would love to give my bathroom a makeover too. Can’t wait to see the finished picture. I love the shiplap walls! It’s going to look so pretty when it’s done. I may move to Waco just so I can have Joanna Gaines do my house. Wow what a tease you are! 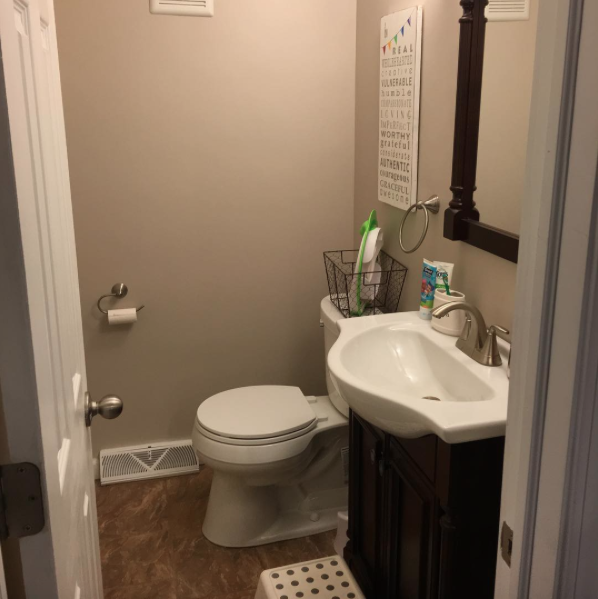 I would love to redo my bathroom, but we don’t own our home right now, so there is so little we can do. We cant even paint. 🙁 I can’t wait to see more. I am sure you are so excited about this project. I love the colors you chose and I can’t wait to see the result. This is starting to look so great! I can’t wait to see how it turns out. 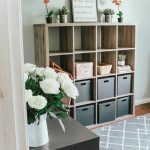 I get so excited when I see makeover projects. We will be moving into our own house at the end of the year and I can’t wait to start renovating. We just bought our first home! All the renovating is exhausting at times. This look would be great for our nautical themed bathroom I am working on!